Rank and organization: Private First Class, U.S. Marine Corps Reserve. Born: 29 January 1925, Racine, Wis. Accredited to: Wisconsin. Citation: For conspicuous gallantry and intrepidity at the risk of his life above and beyond the call of duty while serving with the 4th Battalion, 10th Marines, 2d Marine Division, in action against enemy Japanese forces on Saipan, Marianas Islands, 7 July 1944. When the enemy launched a fierce, determined counterattack against our positions and overran a neighboring artillery battalion, Pfc. Agerholm immediately volunteered to assist in the efforts to check the hostile attack and evacuate our wounded. Locating and appropriating an abandoned ambulance jeep, he repeatedly made extremely perilous trips under heavy rifle and mortar fire and single-handedly loaded and evacuated approximately 45 casualties, working tirelessly and with utter disregard for his own safety during a grueling period of more than 3 hours. Despite intense, persistent enemy fire, he ran out to aid 2 men whom he believed to be wounded marines but was himself mortally wounded by a Japanese sniper while carrying out his hazardous mission. Pfc. Agerholm's brilliant initiative, great personal valor and self-sacrificing efforts in the face of almost certain death reflect the highest credit upon himself and the U.S. Naval Service. He gallantly gave his life for his country. Rank and organization: Sergeant, U.S. Army, Company A, 105th Infantry, 27th Infantry Division. Place and date: Saipan, Mariana Islands, 19 June to 7 July 1944. Entered service at: Troy, N.Y. Birth: Troy, N.Y. G.O. No. : 35, 9 May 1945. Citation: For conspicuous gallantry and intrepidity at the risk of his life above and beyond the call of duty at Saipan, Mariana Islands, 19 June to 7 July 1944. When his entire company was held up by fire from automatic weapons and small-arms fire from strongly fortified enemy positions that commanded the view of the company, Sgt. (then Pvt.) Baker voluntarily took a bazooka and dashed alone to within 100 yards of the enemy. Through heavy rifle and machinegun fire that was directed at him by the enemy, he knocked out the strong point, enabling his company to assault the ridge. Some days later while his company advanced across the open field flanked with obstructions and places of concealment for the enemy, Sgt. Baker again voluntarily took up a position in the rear to protect the company against surprise attack and came upon 2 heavily fortified enemy pockets manned by 2 officers and 10 enlisted men which had been bypassed. Without regard for such superior numbers, he unhesitatingly attacked and killed all of them. Five hundred yards farther, he discovered 6 men of the enemy who had concealed themselves behind our lines and destroyed all of them. On 7 July 1944, the perimeter of which Sgt. Baker was a part was attacked from 3 sides by from 3,000 to 5,000 Japanese. During the early stages of this attack, Sgt. Baker was seriously wounded but he insisted on remaining in the line and fired at the enemy at ranges sometimes as close as 5 yards until his ammunition ran out. Without ammunition and with his own weapon battered to uselessness from hand-to-hand combat, he was carried about 50 yards to the rear by a comrade, who was then himself wounded. At this point Sgt. Baker refused to be moved any farther stating that he preferred to be left to die rather than risk the lives of any more of his friends. A short time later, at his request, he was placed in a sitting position against a small tree . Another comrade, withdrawing, offered assistance. Sgt. Baker refused, insisting that he be left alone and be given a soldier's pistol with its remaining 8 rounds of ammunition. When last seen alive, Sgt. Baker was propped against a tree, pistol in hand, calmly facing the foe. Later Sgt. Baker's body was found in the same position, gun empty, with 8 Japanese lying dead before him. His deeds were in keeping with the highest traditions of the U.S. Army. Rank and organization: Private First Class, U.S. Marine Corps Reserve. Born: 14 July 1923, Akron, Ohio. Accredited to: Ohio. 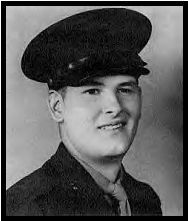 Citation: For conspicuous gallantry and intrepidity at the risk of his life above and beyond the call of duty while serving with the 1st Battalion, 6th Marines, 2d Marine Division, in action against enemy Japanese forces on the Island of Saipan in the Marianas, on 25 June 1944. With his machinegun emplacement bearing the full brunt of a fanatic assault initiated by the Japanese under cover of predawn darkness, Pfc. Epperson manned his weapon with determined aggressiveness, fighting furiously in the defense of his battalion's position and maintaining a steady stream of devastating fire against rapidly infiltrating hostile troops to aid materially in annihilating several of the enemy and in breaking the abortive attack. Suddenly a Japanese soldier, assumed to be dead, sprang up and hurled a powerful hand grenade into the emplacement. Determined to save his comrades, Pfc. Epperson unhesitatingly chose to sacrifice himself and, diving upon the deadly missile, absorbed the shattering violence of the exploding charge in his own body. Stouthearted and indomitable in the face of certain death, Pfc. 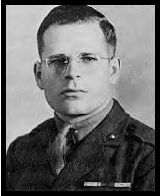 Epperson fearlessly yielded his own life that his able comrades might carry on the relentless battle against a ruthless enemy. His superb valor and unfaltering devotion to duty throughout reflect the highest credit upon himself and upon the U.S. Naval Service. He gallantly gave his life for his country. Rank and organization: Sergeant, U.S. Marine Corps. Born: 14 February 1919, Americus, Kans. Accredited to: Kansas. Other Navy award: Bronze Star Medal. Citation: For conspicuous gallantry and intrepidity at the risk of his life above and beyond the call of duty as tank commander serving with the 2d Battalion, 6th Marines, 2d Marine Division, during action against enemy Japanese forces on Saipan, Marianas Islands, on 8 July 1944. Advancing with his tank a few yards ahead of the infantry in support of a vigorous attack on hostile positions, Sgt. Timmerman maintained steady fire from his antiaircraft sky mount machinegun until progress was impeded by a series of enemy trenches and pillboxes. Observing a target of opportunity, he immediately ordered the tank stopped and, mindful of the danger from the muzzle blast as he prepared to open fire with the 75mm., fearlessly stood up in the exposed turret and ordered the infantry to hit the deck. Quick to act as a grenade, hurled by the Japanese, was about to drop into the open turret hatch, Sgt. Timmerman unhesitatingly blocked the opening with his body holding the grenade against his chest and taking the brunt of the explosion. His exception valor and loyalty in saving his men at the cost of his own life reflect the highest credit upon Sgt. Timmerman and the U.S. Naval Service. He gallantly gave his life in the service of his country.